Canberra MRT station is 5 minutes walk from the Visionaire EC location. Across the road from the new Canberra MRT station, within 6 minutes walk, will be a new neighbourhood hub complete with supermarket, shops, food court, and child enrichment, education and childcare centres. Sun Plaza shopping centre at Sembawang MRT station, is one MRT stop north. North Point City, an integrated development at Yishun Central and the biggest shopping mall in the north of Singapore, is one MRT stop south. Directly linked to the Yishun MRT station, a public library, bus interchange, community club, and town plaza. The Woodlands Regional Centre, gateway to Johor & Malaysia and one of the future commercial hubs identified under the URA Masterplan, is 3 MRT stops north. 10 minutes walk from the Visionaire EC location is Sembawang shopping centre, and the delicious array of rustic coffee shops & cafes that line Sembawang Road that make it a foodie’s haven. 2km north along Sembawang Road are the laid back calm and breezes of Sembawang Park and beach. Medical care is available close by at Khoo Teck Puat Hospital and Yishun Community Hospital, near Yishun Central. 400m (around 5 minutes) walk to the future Canberra MRT station (opening 2019). 27 minutes train ride from there, to Orchard MRT station. Direct train ride, about 35 – 40 minutes, to Raffles Place and Marina Bay. 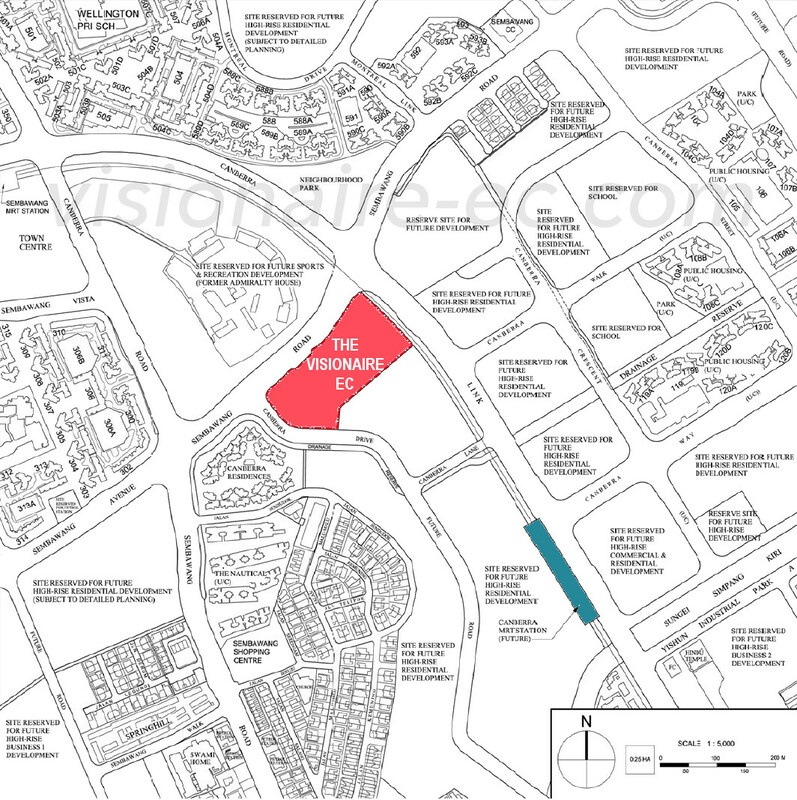 The Visionaire location is a 5km drive through Woodlands Avenue 12 to the SLE (Seletar Expressway). Westwards from there is the Bukit Timah Expressway; eastwards is the TPE (Tampines Expressway) going to Changi Airport & the CTE (Central Expressway). Driving to town will be faster in future when the NSE (North-South Highway) is completed. See fact sheet details here.